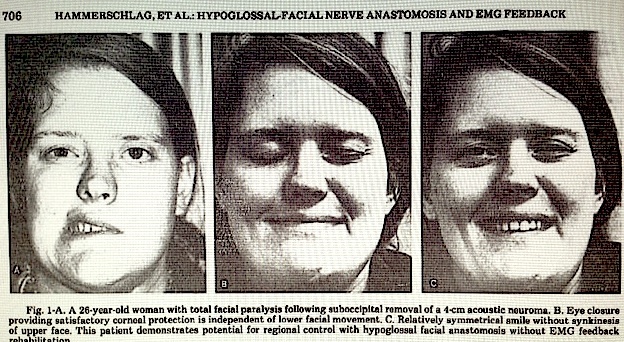 Facial paralysis can result from multiple causes, most commonly from trauma, congenital malformation, tumor resection or Bell’s palsy. Early diagnosis is important, to rule out correctible causes and to act before facial muscle degeneration. In children, elective reconstruction can be considered after 2 years of age. The extent of paralysis, and patient history combined with clinical examination dictate the choice of treatment. The anatomic arrangements of the facial nerve and facial muscles are complex, requiring a keen sense of microsurgical anatomy and significant experience in order to treat. The ultimate goal of reanimation surgery is to restore spontaneous animation and a balanced natural smile. Dr. Hammerschlag has performed over 70 facial nerve grafts, which is one of the largest experiences with facial nerve grafting in the United States. He also works with a newly established multidiscipline group of physicians and physical therapists at New York University Medical Center Facial Nerve Center. Cohen, J.P., Lachman, L.J., and Hammerschlag, P.E. : Reversible Facial Paralysis in Sarcoidosis. Arch. Otol. Vol. 108, No. 12, 832-835, 1983. Hammerschlag, P.E., John, E.R., Prichep, L.S., Berg, H.M., Cohen, N.L., and Ransohoff, J.: Intraoperative Real-Time Monitoring of Brainstem Facial Evoked Response (BFER), In: Proceedings of the Fifth International Symposium on the Facial Nerve, M. Portmann, M.D. (ed). Paris: Masson Publishing USA, Inc., 376-381, 1985. Hammerschlag, P.E., Berg, H.M., John, E.R., Prichep, L.S., Cohen, N.L, and Ransohoff, J Real-Time Monitoring of BAER During Cerebellopontine Angle CPA) Surgery. Otolaryngology-Head and Neck Surgery. Vol. 95 No. 5 538-42, 1986. Hammerschlag, P.E., Brudny, J., Cusumano, R., Cohen, N.L. : Hypoglossal Facial Nerve Anastomosis and Electromyographic Feedback Rehabilitation. Laryngoscope. Vol. 98: 405-410, 1988. Hammerschlag, P.E., Breda, S.B., Cohen, N.L. : Intraoperative Monitoring for Preservation of Facial Nerve Function Cerebellopontine Angle Surgery: Proceedings VI International Symposium on the Facial Nerve. Kugler and Ghedini, Amsterdam, 1989. Hammerschlag, P.E., Cohen, N.L. : Intraoperative Monitoring of the Facial Nerve in Cerebellopontine Angle Surgery. Otolaryngology- Head and Neck Surgery. Vol. 103: 681-684, November, 1990. Hammerschlag, P.E., Cohen, N.L., Brudny, J.: Facial Paralysis Rehabilitation with Jump Interposition Graft Hypoglossal Facial Nerve Anastomosis and Gold Weight Upper Lid Implantation. Proceedings of the First Acoustic Neuroma Conference, Kugler and Ghedini, 1991. Hammerschlag, P.E., Cohen, N.L., Brudny, J., Palu, R.: Management of Facial Paralysis with Jump Interposition Graft Hypoglossal Facial Nerve Anastomosis and Gold Weight Upper Lid Implantation Euro Arch Oto-Rhin. Lar. 137-39, 1993.